This has been a banner year for Ultra4 racers wanting to compete in the 2011 King of the Hammers. Jeff Knoll and Dave Cole of Hammerking Productions have expanded the qualification events throughout the United States and Canada to put a qualifier within a days drive of anyone in the North America. 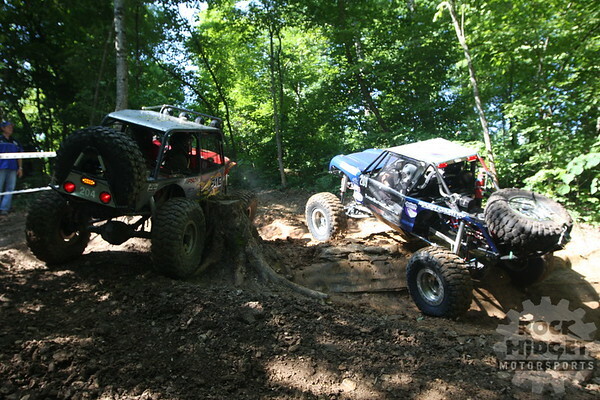 Southern Missouri Off Road Ranch (SMORR) is the second stop in the KOH 2011 qualification events and the third and final stop for the new International Endurance Championships (IEC). The IEC is a point based race that combines King of the Hammers 2010, Rausch Creek Qualifier and SMORR. The racer with the most points after these three races will be the first ever IEC Champion. Being the last stop in this important point series was a major draw for some serious driving talent from around the country. SMORR, is located in southern Missouri 45 minutes southeast of Springfield. SMORR has 930 acres of rolling rocky hills, with beautiful hardwood trees and flowing water. Having had the pleasure of wheeling some of the major private parks in the country, I can honestly say that the facilities at SMORR are the nicest I have ever seen. The main camp is equipped with everything from a full restaurant to air conditioned showers, camper hookups and bathrooms. These beautiful facilities are a wonderful compliment to an incredible network of well marked trails and roads that make SMORR one of the premier four wheeling destinations in the country. One of the best things about SMORR and the KOH Qualifier was the way SMORR owner Brandon Powell laid out the race course. Beginning and ending in the main camp, plus throwing in some extremely spectator friendly choke points made watching and covering this event a breeze. With the race course running next to and around the main gravel road, all of the spectators were able to take stock 4x4 vehicles into the deepest parts of the track without getting in the way of the racers. The course design was a mix of tight wooded trails, steep wet ledges and short go-fast sections that saw top speeds of 75 mph! When the green flag dropped, we were waiting in the woods just 1/2 mile into the course where a fallen tree, steep ledge and a large stump made a natural tight spot that would surely entice the racers to try for a pass early on. Jeff Knoll told me to be there when the flag dropped and I would not be disappointed. As is usually the case, Jeff was spot on! Having roped off an easy bypass, the racers were either going to shift into low range and run straight up the ledge or try to stay in high and bounce around the stump. From there we loaded up the Rhino and headed across the park to watch the action on Double Whammy. Along the way, we watched racers coming out of a tight, wooded section and splashing through some Missouri mud! Shawn Fisher points directly at the mud and mats it! After this group passed, we arrived at Double Whammy for some of the best action of the day. Race leader (at the time) Rosco Rietdorf was plugging the left side of Double Whammy, blocking the only relatively dry line. Just then, Lucas Murphy tries to run up his left side and was also unable to get the needed traction. Both co drivers dive out and the winch race was on! Lucas Murphy's Warn 8274 won the race! Once Lucas cleared the way, Eric Miller high marked the trail and literally skipped passed Rosco as they searched the ground for their window net rod. When the line on Double Whammy was clear, the racers like Richie Keller below just launched up the left side staying high enough so the rear tire does not slide across the last ledge. When the drivers did not carry enough speed up the hill, carnage almost always ensued. Word is Matt Overton and Levi Shirley had "rolls of the day" here that we will all be able to see when Speed airs the show on TV! Mike Coleville does not carry enough speed on his first try on lap 3 and gets tippy! We then took advantage of the excellent feeder road and headed over to Adventure Hill. After 2 or 3 laps, most of the racers came up with a strategy for the deep ruts on Adventure Hill. Some racers hung to the right and floored the accelerator and bounced right up. Some started in the middle and ended up on the left. Finally, some racers nosed up the the ledge and jumped out and used the winch. Erik Miller really struggled on this line. He tried the left and was in the process of running over a winching Shawn Fisher when Levi Shirley flew by on the left and spanked it. Miller backed up and followed Levi's lead and made the dirt fly all the way to the top. The action on Adventure Hill was non-stop. Being the only on-course checkpoint, it was great viewing from here because you could check with the time keepers and see what lap people were on. While I was there, Lucas Murphy and Mike Coleville all came through on their 3rd and 4th laps while some racers were just making their 2nd laps! It was really amazing to see how fast the race leaders were making the laps. I think most of the pace setters were running 30-40 minute laps. 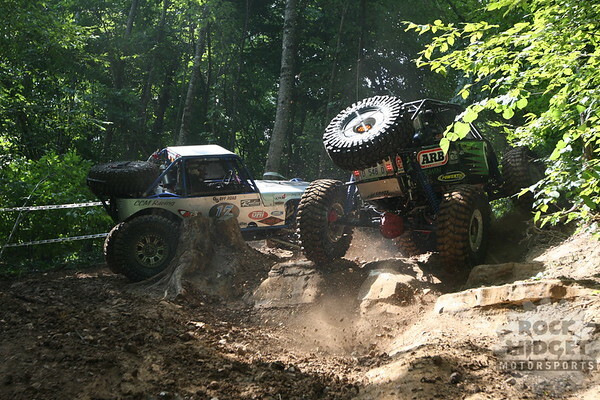 Derek West using all 50* of his Spidertrax steering to work his way up Adventure Hill. On his last lap, Derek rolled completely and landed on his wheels. From Adventure Hill, we rode out watching the action on each side of the access road. We passed both Shannon Campbell and Loren Healy as they reentered the race after they had to drive back to the pits for repair. Although this was not exactly in the pre-plan for the race, Jeff and Dave wanted to make sure these racers that drove so far to race were able to get back on course. Both the "Kings" drove like they were possessed to try to work their way back to the top of the pack after loosing so much time in the pits. One of the only real fast sections of the course was in the first mile. Racers drifted hard into the straight-away and hammered down. It was awesome being passed by the racers at speeds up to 75 miles per hour. After the race leaders passed us for their 6th and final lap, we all headed back to the finish line to watch them come across for the checkered flag. Because of the lap race format, all of us had heard the 20 racers all day and had gotten pretty good at recognizing their exhaust note. It helped a ton since no race numbers were visible through the caked-on Missouri mud. First to cross the line was Massachusetts racer, Lucas Murphy. Lucas drives a home-built buggy that is a bit too tall and a bit too narrow, with parts borrowed from here and there. That said, the combination of a tough, race-proven vehicle and superb driving ability allowed Lucas to edge out fellow north easterner Erik Miller for the win. Just behind these two was Mike Coleville who drove the entire course with his left hand in a cast! Rosco and Richie Keller rounded out the top 5 respectively, all crossing the finish line with very close times. After the dust settled, only 16 racers crossed the finish line. Mike Colville, Rosco Rientdorf, Richie Keller, Travis Cook, Matt Enochs, Matt Overton and Rob Usnick all qualified for the 2011 King of the Hammers. It was a rough but fair course and the Ultra4 drivers once-again showed unparalleled sportsmanship on the course and in the pits. Also due to some race operation changes allowing broken racers to keep racing, 2 additional spots were allowed to enter clearing the way for MattO and Usnick to be qualified for the Hammers. Hammerking did a great job working this all out on the fly and everyone came away happy. No KOH race is complete without the afterparty. The SMORR crew went above and beyond booking one of the most incredible fireworks shows I have ever seen. That coupled with some Camo asshattery, Dave Cole rental car antics and some RZR wheelies, the night was one to remember forever. I am personally looking forward to my next trip to SMORR to try my own luck on the racecourse and over some of the great trails. If you are looking for a superb weekend destination, look no further than SMORR.net. See you guys on the trail! If you'd like to view the live blog from Saturday's race, simply click the "replay" button below.